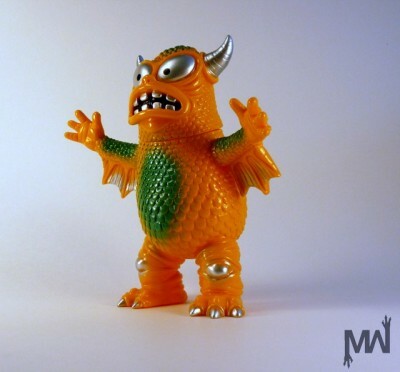 toybot studios: Jeff Lamm x Monster Worship Greasebat - Toy Karma 3 Exclusive..!! 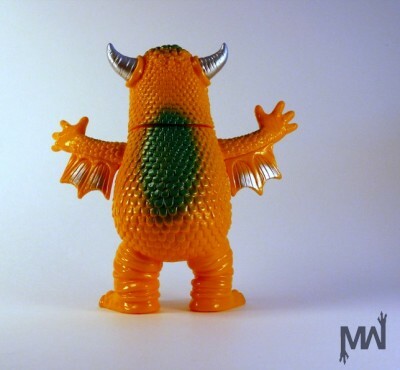 Jeff Lamm x Monster Worship Greasebat - Toy Karma 3 Exclusive..!! 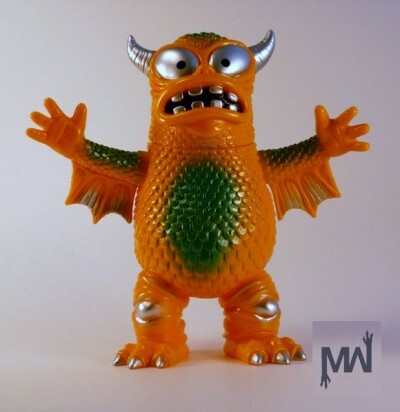 Behold the newest limited edition painted colorway of the Real Fighting Greasebat vinyl figure inspired by vintage kaiju colorways of old. Cast in a orange vinyl, highlighted with Green sprays, with metallic Silver horns and Silver accent sprays. RFG Greasebat stands approx. 7" tall with three points of articulation. Greasebat was designed by Jeff Lamm. Sculpted by Chauskoskis. Produced by Monster Worship. Made in Japan. Monster Worship will not be offering any of these for sale publicly. These will only be available exclusively at Toy Karma III @ Rotofugi Gallery opening on Saturday Sept. 10, 2011.